ABC is yet to confirm its broadcast time for the season premiere of Doctor Who, following changes to the playout in the UK. But it has confirmed it will be fast-tracked to iview with a Monday broadcast on ABC’s primary channel in HD on Monday October 8. Short of making changes to its Monday line-up that strongly suggests a 5:55pm screening on ABC for the 65 minute opening episode (to be confirmed). Screening it after Q&A at around 10:40pm would be particularly unfair to Whovians, which is confirmed to screen on ABC Comedy directly afterwards. 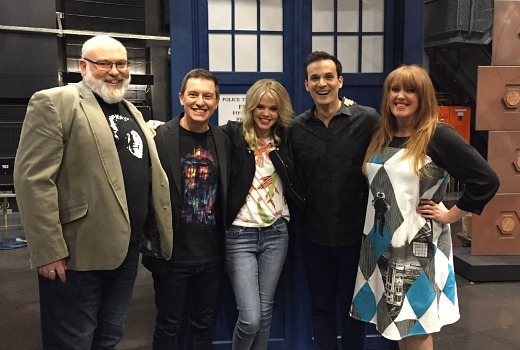 Rove McManus and his team of super fans are also back, with Whovians, the half-hour Doctor Who fan show, returning to ABC Comedy on Monday nights (Time TBC). Airing Monday nights after the ABC’s broadcast of Doctor Who, Rove will be joined again by Adam Richards, Tegan Higginbotham, Steven O’Donnell, Justin Hamilton and guests, with the team ready to welcome Jodie Whittaker and her new time travelling friends. “I’m thrilled to be back with the Whovians team to talk, dissect and geek-out about Doctor Who, our favourite show on TV. Especially since we’d happily do it for free without television cameras anyway. It’s also going to be extra exciting this year as we welcome Jodie Whittaker to the role of the Doctor. I can’t wait to see where it takes us,” said Rove McManus. Filmed in front of a live studio audience, the 11th series of Doctor Who offers a galaxy of things for Rove and the panel to dissect, delve into and celebrate. So get ready to get on board. I’m more interested to find out when taping will take place. Will it be Monday afternoon, or, as it took place for the Christmas special last year, day/s before local transmission. If the latter, then is a Sunday taping possible? Bound to be Mondays now, but I suspect they have had to rearrange in order to accommodate. I think 6pm Monday would certainly give the news a good lead in. Reminds me of when the ABC would show classic doctor who at 6:30pm Monday-Thursday from 2003 to about 2006, I’d love it they did it again so that a new generation of fans could get the oportunity to watch the classics. I agree, 6pm (adjusted weekly for ep length) would be ideal. Fast track it on iView and repeat it later in the week. This would allow anyone interest to catch it ‘live’ or record it or watch online. As long as they don’t wait until the following Saturday night, that would be unacceptable IMHO. Wouldn’t be surprised if they repeat at 7:30pm on ABCME as they have shown old ones there (and simulcast in Capaldi’s final season), plus had the spin-off’s in Class, Sarah Jane Chronicles and Torchwood at times, so even a same or next day repeat may happen. It doesn’t matter to me where it is placed, i record everything anyway and watch later in the evening. Just glad that it is being fast tracked. I am confused with whovians coming back …. shouty rove laughing and gushing at his own jokes? I hope they make some changes to the last format used in Whovians. I watched a couple of episodes and found it to be absolutely cringe worthy, especially Adam Richards. Surely a 5:50pm viewing isn’t the answer. Maybe ABC HD breaks away from ABC TV in prime time between 7:30-8:30pm. Last time that happened was in 2008 though (for the Paralympics). Other option could be moving Aus Story to Tuesday, and Four Corners / MW / QandA playing out thirty minutes later. I did hear previously it would not impact current Monday line-up, not sure if it still stands.